I know it's a little late, but I thought it would be good form to post the solution to the previous off-day puzzle prior to the next puzzle going live. First things first, you had to unscramble the word bank. The unscrambled words are all items that belong in groups of seven. The 14 categories are: Chakras, Colors, Continents, Days of the Week, Deadly Sins, Dwarfs, Events in the Heptathlon, Harry Potter Novels, Hills of Rome, Liberal Arts, Samurai from "Seven Samurai", Seven Sisters Colleges, and Words You Can't Say on Television. It's not hard to guess where things are going at this point. 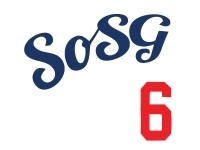 We have all the letters there, and in the right positions, we just need to switch things around so they are in the correct sets to see that the puzzle is referring to former Dodger #7 Alfredo Griffin! Congratulations to correct solvers Ubragg, Sax, and QuadSevens! Tune in tomorrow for more hot, nerd-on-nerd action! ALFFEDN GRIRFIO is how Stubbs pronounces Alfredo Griffin at the end of SoSG Fest.